Personal Training Institute is a unique organization offering customized one-on-one fitness and nutrition programs to individuals looking to improve their health and help them lose weight. The concept was established in 1987 when Evelyn Knapp and Carol Kur co-founded a personalized strength training and weight loss facility. They demonstrated that training which targets muscle strength and optimal nutrition achieves better results in less time than the competitor programs. 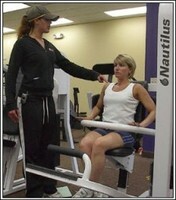 Relying on a combination of custom-tailored workout session, nutrition counseling, motivation techniques and best in the business exercise equipment, their programs offered great success to participants from first time exercisers to advanced athletes. This became the foundation for what is now the most prestigious and effective chain of exercise and nutrition centers backed by a skilled staff of certified personal trainers, nutritionists and business professionals. Why Should I Invest in a PTI Franchise? • PTI gets results. The Company's one-on-one, personal training environment combined with an 80% success rate supports higher revenue per member. • PTI combines both exercise and nutrition under one roof. Our focus on providing an intimate, one-on-one training environment allows our centers to operate using only 10% of the space demanded by the average fitness center. • PTI benefits from a high retention rate. The Company's personal, one-to-one delivery compliments personal, one-to-one selling which results in a high retention rate while lowering origination costs. • PTI emphasizes quality, not quantity. With higher revenue per member and per square foot, fewer members are needed to reach profitability. • PTI's programs are time efficient and enormously effective, with most of our clients achieving successful results in just three efficient one-half hour sessions per week. • PTI's low capital expenditure, lower acquisition cost of client and higher revenue per square foot results in rapid growth and sustained profitability. We want to help our franchisees create a successful personal training center without making the costly mistakes of a new business. We will provide you with guidance in start-up as well as in day-to-day operations. Here are just some of the ways a Personal Training Institute franchise can start you on the road to their own business. • On-going hotline for problem clients. • Lease Negotiation - We will help to identify sites and negotiate leases with realtors, creating the most favorable conditions for your lease. • Architectural Plans - Our designers will create the most cost effective usage of space enabling you to minimize your real estate overhead and maximize your trainers' efficiency. • Construction Support - We will work with you to ensure the club is built efficiently and timely. • Advertising - You will receive advice on economical local advertising and promotions that really work. From Pre-opening to Grand Opening to on-going operations, we will provide you with time-tested collateral materials, from our extensive catalogue of ads, flyers, posters, A-frames, window signs, direct mail pieces, gift certificates etc. that will work in your marketplace. • Equipment Advantage - We will provide you with the most efficient mixture of strength training and cardio equipment at discounted pricing. This will allow you to maximize the floor space and create the perfect solution to routines. • Signage - We will provide specifications for our eye-catching signage with and custom logo. • Owner / Manager Training - We will provide a full management program covering all the necessary areas of running a club including budget management, human resources, operating procedures, facilities & equipment maintenance, marketing and client retention. • Hiring Guide - We will provide a structured interview to get you through the complicated maze of illegal questions and unlawful hiring practices. • Human Resources Training - We will educate you on legal requirements for wages, postings and procedures steering you away from the danger of non-compliance. • Levels Training - Through videos, certification test, and manuals, we will supply the information and education for your trainers to achieve higher levels of proficiency and confidence. • Nutritional Programming - Our ColorFit program boasts a success rate of 80%. We will provide the structure, worksheets, customized food programs, dining out guides and tips to get clients hooked on this unequaled program. • Buying Power - Through our negotiated buying programs, we can provide cost savings for supplies, equipment accessories, advertising and payroll processing. • Development and Research - Our team of exercise physiologist and Registered Dieticians will continually refine and develop programs aimed to motivate clients and keep their experience fresh. • Web Site - You will have access to our web site, which provides answers to fitness and nutrition questions as well as leads for new clients.